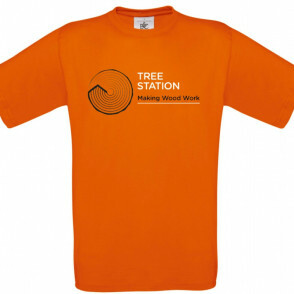 NEW: TreeStation T-Shirt – Support the TreeStation by wearing our logo whilst you’re out and about! These T-shirts are ethically accredited and printed in a sustainable manner. Please Note: T-shirts are posted to anywhere in the UK for a standard charge of £2 when ordering 1 item, this will be added on in our Order Confirmation Email. If you’re ordering more than one t-shirt, we’ll work out the price and let you know the total before it’s confirmed. Please see our delivery details for more information. You can support the TreeStation in many different ways – asking us to do your treework, buying our firewood and timber, or even becoming a fully fledged member. Well, NOW, if you want to show off your stylish side at the same time, you can wear our logo proudly on your chest in one of our new, printed TreeStation T-Shirts! Printed on our favourite colour fabric, these T-shirts are a great way to make a bold statement that you’re supporting our mission to combat climate change and create a local, wood-based economy in Manchester! These T-shirts are ethically accredited by the Fair Wear Foundation, ensuring fair working conditions for those based within the factories producing these products. The T-shirts are further Oeko Tex certified, ensuring that harmful substances legal or otherwise are not used within the products, something vital and highlighted by Greenpeace, with a number of top brand products containing hazardous chemicals.